I get so excited when I find something so fun to share. This is a perfect quick way to change our attitudes when tackling after holiday chores. Author Pragito Dove has provided us with a Four-Minute Meditation in her book Laughter, Tears, Silence - Expressive Meditations to Calm Your Mind and Open Your Heart. 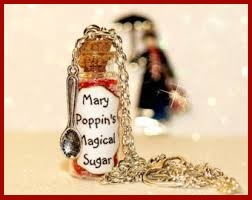 Start by bringing Mary Poppins into our imagination. Step one – choose a job you need to do. Notice your attitude. Is it a drag? Is it something to get through in a hurry? Step Two-Snap your fingers. Sing, skip, whistle, dance – do whatever it takes to turn this chore into a fun activity. Work or play as this is the most fun in the world. 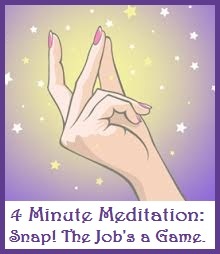 Okay, your laughing but it is a great way to get meditation into your schedule. 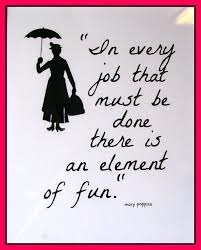 How often can you include taking care of a chore, sing or dance as if you were the magical Mary Poppins and complete a SNAP! meditation? Here is a bonus Four-Minute Meditation called Gather Moments of Joy. Do you feel like you are stuck in a box? Would you like to enhance your creativity? The author points out that Mary Poppins would tell us that “Creativity is the quality that you bring to whatever activity you are doing”. Step one – remember one joyful moment from your childhood when you felt that life was magic. Gather that moment. Close your eyes and remember it. Step two – Now relive this moment. Become a child again. Run, sing, play. As you continue this practice, do it for a longer time ten, twenty, or thirty minutes. If memories are triggered of times your passion for a particular activity was cut off, re-infuse that activity into your schedule with passion now. Your life becomes revitalized with creativity and joy. Remember find your inner Mary Poppins – which includes spending time doing nothing, relaxing, walking in nature, or any downtime that you can fit into your day. This is how we tune into our creativity.